The biggest issue in promoting EnMS is the word "Energy"
Nothing in the world requires a right set of mind more than pursuing performance improvement. This is because the nice word "improvement" requires identifying "issues" and "problems". Whenever facing "issues" or "problems", many prefer to take the "status quo". Energy is a living creature requiring daily improvement and change. From the experience of promoting EnMS in various business operators, you encounter a very peculiar situation in which many in the organisation tend to segregate "energy" from daily business operations. Many are falsely convinced that energy is a matter of the utility facility department. Many are falsely convinced EnMS will increase their workload therefore increasing cost. Many are falsely convinced that even a slight loosening of tap that a child can fix should be fixed by maintenance people by rule. Many are falsely convinced that EnMS in daily operations is to simply switch off lights at lunch time by office workers. Many are falsely convinced that energy cost is so little compared to the revenue amount and therefore energy matters are low on their top management’s priority. Many are falsely convinced that "Energy" is a technical matter so an energy manager should have engineering degree. Two things are being overlooked. The most important energy in energy management system is named "PEOPLE". No one can run a business without the performance of energy, including workers. So I am tempted to call it a "Business Management System (BnMS)" rather than "Energy management System (EnMS)". 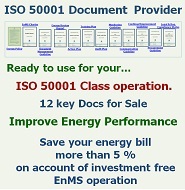 Strong documentation, a foundation to successful EnMS operations. The heart of the ISO 50001 class is to qualify that you have thoroughly documented organizational processes, and that organisation’s workers actually do things in the way that was documented. This means the documentation plays one of the most important roles in ensuring an organisation's "continual performance improvement" resulting from EnMS operations. Establishing sound documents and the proper control of documents are essential in order to maintain, communicate and further improve the management systems with all people involved. The guideline and provisions defined in EnMS Manual (EnMS Charter) should address proper handling of documents including defined structure and procedures as EnMS documentation. We are pleased to announce the partnership formation with Chiyoda System Technologies Corporation (hereinafter refer to as “CST”, President: Hiroyuki Nakasone). With the partnership with CST, we expect to have extensive activities in Japan, and more direct interfacing with energy users. This does not mean we would reduce our attention in our website activities. As a matter of fact we think by having more direct interface with energy users, our website contents will be enhanced and more active. eLearning: "Energy Management Foundation Training"